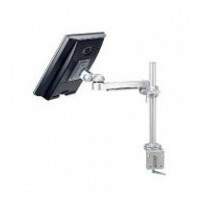 Ergonomic design height-adjustable mount are perfect for a comfortable working space. Aestetic design offers a pleasant enviroment. The sturdy main frame can still move smoothly under heavy load. Easy and efficent cable management. Items can be purchased separately if desired. Grommet typeMade of high quality aluminum alloy.Ergonomic design height-adjustable mount are perfect..